Scout is a Cockapoo of two halves. First, there’s calm Scout. The gentle Scout that, according to Pam, the volunteer who’s looking after her, “likes to lie on my feet when I’m washing up.” Then, there’s full-on Scout! The Scout that nibbles your ears. The Scout that, again according to Pam, “watches me intently when I’m getting her food with little squeaks of excitement, then bounces and spins as she follows me to her eating place.” One day, a deaf person will learn to love life again with little Scout around to help them, and entertain them too. Will Scout become more reserved, more outgoing, or both? Will she always like to nibble people’s ears? How will she eventually help a deaf person? Sponsor Scout, and find out! Hearing Dogs for Deaf People trains dogs that help deaf people leave loneliness behind, through constant companionship. As importantly, they alert deaf people to life-saving sounds like the smoke alarm and intruder alarm, and other important sounds such as the oven timer and baby monitor. It costs approximately £45,000 to breed, train, place and provide lifelong care for each hearing dog. Hearing Dogs for Deaf People rely exclusively on the generosity of organisations and individuals to help fund their work. They receive no funding from the government. Sponsor a puppy with Hearing Dogs for Deaf People from £3 a month. 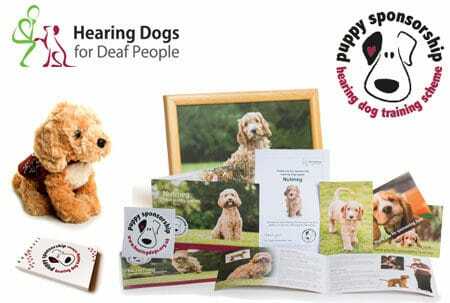 Help to train a dog who will become a life giving support for people with hearing loss. Welcome Pack by Post : The gift pack will be delivered within 14 working days of order. If urgent please mention during sign up process to discuss quicker delivery. Last Minute Gift? eCertificate can be downloaded to give on the day. Scout is a Cockapoo, a cross between a Cocker Spaniel and a Poodle. Cockapoos make great hearing dogs because they’re very friendly and outgoing characters. Hearing dogs help deaf people by alerting them to sounds. As importantly, they also help deaf people leave loneliness behind, to reconnect with family, friends, community… with life. It takes about 18 months to train a hearing dog like Scout. The Hearing Dogs charity receives no government funding to do this, so every sponsorship is incredibly valuable. Hi, I’m Scout! I’m a cute Cockapoo, who likes to study, observe, watch – then really go for it. I want to help a deaf person embrace life one day. Will you sponsor me, and help me do this?